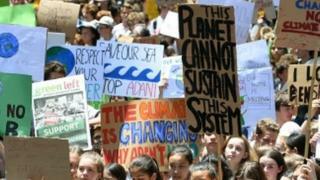 Thousands of children in Australia have skipped school today to protest against climate change. They're unhappy with their prime minister and government, and want them to do more to tackle the issue. Australia's seen some extreme weather recently. There's been a heat wave and hundreds of bush fires in one part of the country. But in another area there's been thunderstorms, heavy rainfall and flooded roads. Many believe this weather is due to climate change. The students who are protesting are also unhappy at the announcement of a new coal mine in the country and are worried about the country's famous Great Barrier Reef. "If we don't stop temperatures going over two degrees we won't have the Great Barrier Reef, Antarctica will melt and there will be no such thing as polar bears," said 11-year-old Lucie, one of the protestors, to the crowd. "My life will be so much more complicated than my parents' life, because of one simple thing: climate change." What do you think about climate change? Would you like to get your say on it? Climate change: What is it and why is everyone talking about it? March for Our Lives: What is it and what's happening? I think they are very brave and inspiring in standing up for what they believe in.